©The following recipes may be considered a continuation on the post on buffalo [bison] in Alabama. Cookbooks weren’t being published in America during the heyday of buffalo cookery so while there are few actual recipes in early sources, there are many recorded instances of eating buffalo. As for the cooking, the following accounts, with a little imagination, will serve us well. For this article, a buffalo ”chip” is not a piece of crunchy meat, and buffalo does not refer to a chicken wing swimming in hot sauce, or to a species of fish. The prime cuts from a buffalo were the hump and the tongue followed in preference by the liver, ribs, and marrow bones. A sinful amount of meat went to waste when herds were slaughtered for their hides and, “the carcasses were left to the wolves and buzzards.” There was a market for salted buffalo tongues [sometimes referred to as pickled], but the harvesting was still sinfully wasteful, the tongue often being the only cut harvested from an animal. Salted tongue, required removing enough of the salt to make it palatable when served. It was often boiled in successive waters (pouring off the water and replacing it with fresh water during the cooking process) or soaking it prior to cooking, again often in successive waters. “The salter [sic]meat is, the longer it should be boiled. If very salt, it is well to put it in soak over night; change the water while cooking…”. “Buffalo’s tongue should soak a day and a night, and boil as much as six hours”. Buffalo ribs from the humps were much appreciated and could be roasted by propping them up near a fire. Let’s look at words penned b y Josiah Gregg for an idea of the quality of the meat that was so vastly wasted. “The flesh of the buffalo is, I think, as fine as any meat I ever tasted: The old hunter will not admit that there is anything equal to it. Much of its apparent savoriness, however, results perhaps from our sharpened ‘prairie appetites’ and our being usually upon salt provisions awhile before obtaining it. The flesh is of coarser texture than beef, more juicy, and the fat and lean better distributed. This meat is also very easy of digestion, possessing even aperients qualities. The circumstance that bulls of all ages, if fat, make good beef is a further proof of the superiority of buffalo meat…Of these, the udder is held as hardly second to the tongue in delicacy. But what the tail of the beaver is to the trapper, the tongue of the buffalo is to the hunter. Next to this are the marrow-bones, the tender-loins, and the hump-ribs.” The author acknowledged that many animals were wantonly slaughtered by travelers and hunters, but said hardly less was, “the still greater havoc made among them by the Indians, not only for meat, but often for the skins and tongues alone (for which they find a ready market amount their traders)…”. Charles Murray said of choice cuts in the 1830’s, “…the ribs, and the back, especially the hump, are, if properly dressed, as sweet, tender, and delicious beef as the most delicate epicure could desire; and both the fat and marrow are certainly finer than those of any domesticated cattle…”. Not sure what to do with marrow-bones? After roasting the bones, the marrow was removed. “…oh, shade of Eude, the marrow-bones! No man can guess what marrow amounts to until he has been to the Far West and eaten it as Wallace, who cooked on the plains for me, dressed it. The bone was brought to table in its full length, and they had some way of hitting it with the back of an axe which opened one side of it only, like the lid of a box. The bone, then, when this lid was removed, exposed in its entire length a regular white roll of unbroken marrow, beautifully done. When hot, as the lid had kept it, and put on thin toast, it was perfection! On inquiry I found that the two extreme ends of the marrow-bone only were placed on the red embers, and the heat of the bone itself dressed the marrow. As far as the bison meat went, it was precisely lean beef; with no more flavor than lean beef in England would have…“. One writer wrote that it took a while to consume a whole buffalo which would have required smoking, drying, or salting to preserve it. “…for a long time, on the general bill of fare at Sydenham’s ranch, was buffalo rump, buffalo tongue, buffalo ribs, buffalo steak, boiled buffalo, jerked buffalo, and dried buffalo…”. We can thank Frederick Townshend for a look at Native American cooking of buffalo meat, but we must look beyond his words for an accurate picture. Rare beef, or in this case buffalo, is much the standard today and would hardly be worth mentioning, but for Townshend it seems to have made an impression. “The Indian manner of cooking buffalo meat is simple in the extreme. Lighting a large log fire, they bend across it sticks of green wood, on which they hang large pieces of flesh. Then, sitting round the fire, they cut strips of meat off with their knives, and devour it half raw…”. “Indians often use wood-ashes as a substitute for salt and never use salt with buffalo-meat; but their liking or preference comes from their habit of invariably broiling buffalo-meat on wood cinders or buffalo-chips” [now you know what chips are]. BUFFALO STEAKS. Rorer, Sarah Tyson. “Mrs. Rorer’s Philadelphia Cook Book.” 1886. Philadelphia. Buffalo steaks are broiled precisely the same as beefsteak, seasoning only with butter, salt, and pepper. Buffalo meat may also be roasted or stewed. Frances Owens tells us that, “Bear and buffalo meats are cooked substantially the same as beef or venison”. Pemmican is made of the lean portions of venison, buffalo, etc. The Indian method is to remove the fat from the lean, dry the lean in the sun; then make a bag of the skin of the animal and put the lean pieces in loosely. To this must be added the fat of the animal, rendered into tallow, and poured in quite hot. This will cause all the spaces to be filled. When cold, put away for future use. In civilized life, a jar can be used in place of the bag. Pemmican may be cooked same as sausage, or eaten as dried beef. It is invaluable in long land explorations, and is of great use in sea voyages. Drury, Newton B., Director, National Par, Service. “The Comeback of the Bison”. Published in “The Rotarian” Dec. 1946. Hooper, Edward James. “The Practical Farmer, Gardener and Housewife”. 1840. Cincinnati. Gregg, Josiah. “Commerce of the Prairies”. 1851. Philadelphia. Murray, Charles. 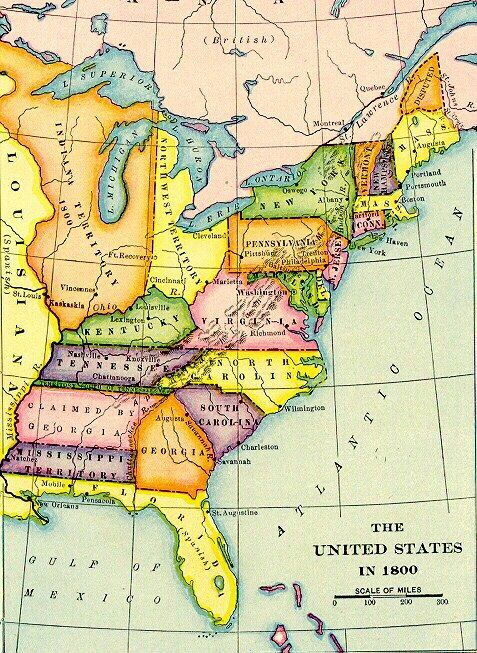 “Travels in North America During the Years 1834, 1835 & 1836. 1839. London. Berkeley, Grantley Fitzhugh. “The English Sportsman in the Western Prairies”. 1861. London. Cooke, Philip St. George. “Scenes and Adventures in the Army: Or, Romance of Military Life”. 1859. Philadelphia. Townshend, Frederick. “Ten Thousand Miles of Travel, Sport, and Adventure.” 1869. London. Rorer, Sarah Tyson. “Mrs. Rorer’s Philadelphia Cook Book.” 1886. Philadelphia. Owens, Frances. “Mrs. Owens’ Cook Book. 1903. Chicago. 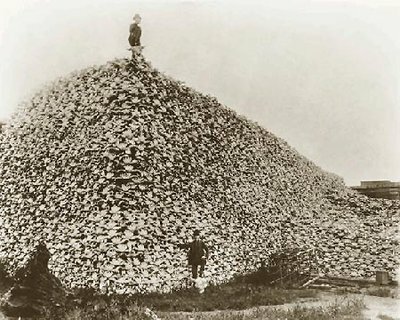 Photo: Two men shown with a mountain of buffalo skulls, public domain. © We are conditioned to think of Native Americans as good stewards of Nature, taking only what was essential for their well-being, yet it is not hard to find first-hand accounts of buffalo hunting which paint a different picture. No one would argue the senseless slaughter and waste of these magnificent animals at the hands of the Europeans, however, the loss of the buffalo also rests on the shoulders of the Indian. “If the chase has been a successful one, the remains of partially dressed buffalos are left; but if not, they [Indians] return, and the carcass is cleaned and meat taken to camp”. “You may say to them that the Indians do not eat all the game they take,–that it is not supposed they eat more than four-fifths of the deer they kill. The skins are of great value to them, and having secured these, the bodies are left for the wolves to devour, and it is much the same with the buffalo; they are hunted for their tongues, and skins, of which they manufacture robes, and sell them to the fur traders. The tongues are esteemed a great luxury. If I should tell you how many thousands of these robes are made and sold in a year by the Osages, and other more distant tribes, you would be astonished that there were any buffaloes to be found within hundreds of miles. Some of their most skillful hunters will kill nearly a hundred deer in five or six weeks. If they do not become civilized before many years, the game will become so scarce that they must waste away in the wilderness, and perish from want”. Adair stated in 1775, “The buffalo herds are now becoming scarce. The thoughtless and wasteful Indians used to kill great numbers of them, only for their tongue and marrow bones, leaving the rest of the carcases to the wild beasts”. Josiah Greg noted in 1835 that travelers and hunters wreaked havoc on the buffalo but that the Indians often killed them merely for their skins and tongues. Romans had described the wanton destruction of the buffalo by those who took, “his tongue only” some 60 years prior . “Still, vast as these herds are, their numbers are much less than in earlier times, and they are diminishing with fearful rapidity…it would be well to attach the most stringent penalties against the barbarous practice of killing buffalo merely for the sport, or perhaps for the tongues alone. Thousands are killed every year in this way. After all, however, it is perhaps the Indian himself who commits the mischief most wantonly”. Joel Allen studied the destruction of the buffalo with astonishing results, particularly regarding the Indians’ part in decimating the herds through the sale of buffalo robes. For the most part the hides were the only part of the animal that was harvested in those endeavors. His figures were taken from such notable sources as a partner in the American Fur Company and a railroad agent’s reports on the transportation of the robes and given the average waste of some three to five animals for every robe produced he arrived at the figure of 1,800,000 animals killed just by one group of Indians during a three or four month period annually. That does not include the robes kept for their own use. For doubters of the figure, let us consider the number of such robes that were received at only a few posts on the Upper Missouri during a season. Ft. Benton – 36,000 robes; Ft. Union 30,000; Ft. Clark and Ft. Berthoud about 10,000 each; Ft. Pierre 19,000; bringing the total for the year to about 75,000, “which he informed me was about the annual average at that period”. The number of buffalo products he quoted that were enumerated by the auditors of the Kansas Pacific and other railways which hauled them was mindboggling for the same year, but it cannot be determined how much of them white hunters or Indians were responsible for. It might be noted that at the time this research was gathered and these killings took place [1871-2], herds had already dwindled to a mere fraction of what they’d been a century before and were completely nonexistent in some states. Caitlin described in detail a one-day Sioux hunt in 1833 at the mouth of the Teton, when some 600 Sioux came into the settlement of the Fur Company at sunset with “fourteen hundred fresh buffalo tongues”, which they exchanged for a few gallons of whiskey. He said not one skin, nor one pound of flesh was saved from the slaughtered buffalo, everything save the tongues left to rot. After describing the methods used by Native Americans to hunt deer and elk, John Hunter wrote, “The Indians seldom eat the flesh of either of these animals, while that of the buffalo can be obtained; it is, nevertheless, excellent in its season, particularly that of the deer”. He said further that while the Indian had once venerated the beaver, upon discovering the value the whites attached to the skins, they, “hunt it with an avidity and industry that threaten in the course of a few years to eradicate them from their hunting grounds”. Alaska natives also hunted for the hides alone. Treasury agents noted in 1898 seeing bales of hides waiting to be shipped and upon inquiring what was done with the meat were told that the deer were shot only for the hides. “White men go out and kill the animals for fun…The natives kill them, because they can get a drink of whisky, valued at 25 cents, for every skin secured”. There are accounts to the contrary, so perhaps the wastefulness varied between tribes, or, perhaps Ernest Seton was correct in saying, “Many of the Indians armed with rifles have learned to emulate the white man, and slaughter game for the love of slaughter, without reference to the future. Such waste was condemned by the old-time Indians, as an abuse of the gifts of God, and which would surely bring its punishment”. SOURCES: Batty, Joseph H. “How to Hunt and Trap: Containing Full Instructions for Hunting the Buffalo, Elk, Moose, Deer, Antelope, Bear, Fox, Grouse, Quail, Geese, Ducks, Woodcock, Snipe, Etc., Etc.” 1878. NY. U.S. Dept. of the Treasury. “Seal and Salmon Fisheries and General Resources of Alaska. 1898. Washington. Thorpe, Thomas Bangs. “The Mysteries of the Backwoods, Or, Sketches of the Southwest”. 1846. Philadelphia. Tuttle, Sarah. “Letters on the Chickasaw and Osage Missions”. 1833. Boston. Greg, Josiah. “Commerce of the Prairies”. 1851. Philadelphia. Romans. “Natural History of Florida”. Baird, Professor. Pat. Office Rep., Agriculture, 1851-52, Part 2. P. 125. Schoolcraft’s History, Condition, and Prospects of the Indian Tribes of the United States. Vol. IV, p. 94. Allen, Joel Asaph. “History of the American Bison”. 1877. Washington. “The Gentleman’s Magazine”. Aug. 1885. Hunter, John Dunn. “Memoirs of a Captivity Among the Indians of North America, from Childhood to the Age of Nineteen.” 1823. London. Note: This is a non-historical post, hysterical perhaps, but not historical. A recent public announcement showed there are more families living on public assistance in Alabama than there are working families in the state, so I ask you, “Who is paying the bills for these families”? The answer is – hard-working families who are paying more and being taxed to death. Alabama shares the distinction of having more welfare families than working families with sister states Maine, New York, Ohio, Kentucky, Illinois, South Carolina, Mississippi, New Mexico, Hawaii, and California. This is a club to which each of these states should be ashamed to belong. – dated Oct. 2013, Economic Policy Journal.com. I am not alone in my resentment at supporting families in which one or both adults are perfectly capable of working and choose not to. Let’s look at some statistics for 2014. In Alabama welfare recipients can receive benefits that are equivalent to $23,310. yearly, or to break it down further, that is about $11.21 per hour if the recipient worked full time, and they do nothing to earn it. A study by CATO showed there are 35 states where welfare benefits are higher than the salary for a full-time job at minimum wage so there is NO incentive for irresponsible people to work. Let’s look at it another way, “The median salary in Alabama is $29,848. That means a person on welfare can make 78.1 percent of the state’s median salary and live at 136 percent of the federal poverty level” and qualify for all manner of assistance which working families cannot. Abuse of public assistance programs is running rampant in this country. One only has to look at a few forums and web sites or listen to news broadcasts for an idea of how big a problem it is. Fraud includes recipients who sell food stamps for pennies on the dollar and use the money to purchase non-food items, often while their children are receiving two free meals a day at school rather than at home. Total number of Americans on welfare: 12,800,000; total number of Americans on food stamps: 46,700,000; total number of Americans on unemployment insurance: 5,600,000; percent of the U.S. population on welfare: 4.1%; total government spending on welfare annually (not to include food stamps or unemployment): $131.9 Billion dollars. –Source: Dept. of Commerce statistics. To show the depth of the welfare abuse, the Washington Times reported that welfare spending has increased 32% during the Obama presidency – from $563 billion in fiscal year 2008 to $746 billion in fiscal year 2011. How long can this country stay solvent with welfare spending increasing at this rate? We haven’t even touched on the number of children some of the families on public assistance have, and don’t tell me I don’t have the right to tell someone how many children they can have because as long as deductions from my paycheck are helping to support these families I have every right. Remember your parents saying, “As long as you live under my roof you will do as I say”? Same difference. I had two children because I could not clothe, feed, educate, and provide for more than two yet families in which the medical cost of having the children is paid by Medicaid; the cost of feeding them is taken care of by programs such as Alabama Summer Food Service, WIC, Alabama Special Milk Program, Alabama School Breakfast and Lunch Program, and Alabama Food Assistance Program; and homes are warmed or cooled by allowances from the Alabama Low-Income Home Energy Assistance Program and the Alabama Weatherization Assistance program, etc. often have large families. Liberals can ask how can anyone want to deny a family assistance with one of these programs, to which I reply it is a well known fact that another aspect of public assistance fraud is the large percentage of families who receive aid from multiple programs at the same time. Drawing public assistance, (food assistance program or Medicaid) is not the end of the story. Families on those programs and others are entitled to free cell phones, and in fact, in Alabama a Medicaid recipient has to send a letter declining the phone otherwise it is sent as a matter of course. I think of this every month when I pay my cell bill. A family in public housing, drawing SSI, receiving the NSL’s free school lunch program, or Temporary Assistance for Needy Families etc. may also qualify for free phones and free cell service. There have been bills introduced in Alabama that, if passed, would allow drug testing for some welfare recipients, make it a crime to defraud public assistance programs, require welfare recipients to show proof of trying to find employment, etc., but these measures are simply putting a band-aid on a scar. Because of prison overcrowding the state is considering releasing criminals with time remaining on their sentences so it is unlikely someone caught selling food vouchers is going to prison and it is doubtful they’d even see a lapse in benefits. The legal system is not going to suddenly decide to get tough with public assistance abuse unless the system is overhauled from the ground floor up. I agree with Alabama Senator Jeff Sessions – welfare should be viewed as a temporary measure and not as a permanent way of life. From presidential candidates down to the lowliest town mayor candidate may forego their bickering and mudslinging in the coming years, not promise reform they can’t deliver, and tell the American people one thing – what their strategy is for reversing this pattern and rewarding working families for making their own way. You don’t reward an unruly child, so why should you reward someone who chooses not to be a responsible worker with a free cell phone? Wake up America and demand a change while there is time to reverse, or at least slow down, this downward spiral before working Americans are crushed under the weight of entitlement. The following article was published in the Evening Sun, Hanover, PA, by Martin’s niece, the awesome Brigitte Brady and it is so informative that I asked if I could share it. 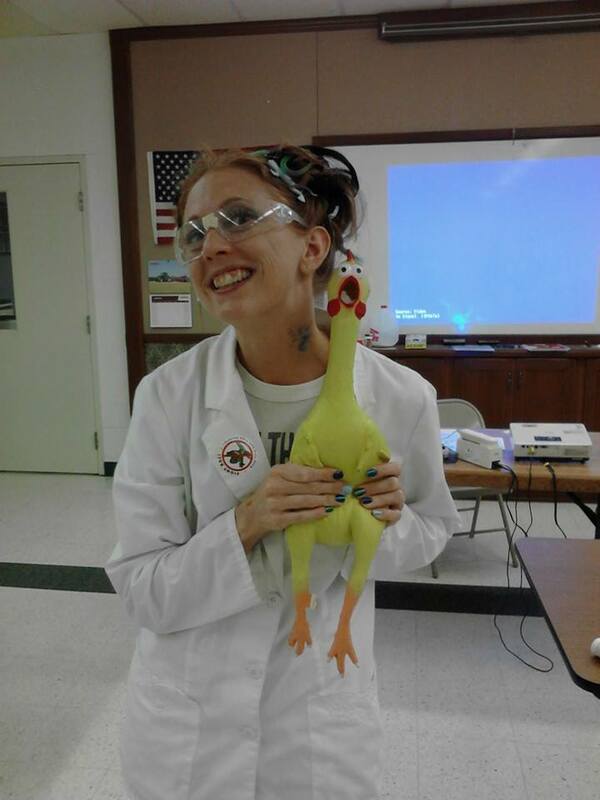 The photo is Brigitte doing a school program on nutrition with her “lab assistant”, Beaker. Why weren’t such classes that much fun when I was in school? We are especially proud of Brigitte because her Grandma, the equally awesome, Mrs. Anna Zartman Brady, wrote a weekly column for the Evening Sun for some 30 odd years and Brigitte is following right along in her footsteps. I would love to see the paper compile her articles into book or CD form so that I could enjoy each and every one. I am so very blessed to be part of this wonderful family! – Blissful Meals Yall, THF. One of my favorite things to do during the spring and early summer in York County is to stroll through one of the many local farm markets and savor the sight and fragrance of the just-picked produce. Everything is so ripe, so fresh and, best of all, nearly everything is locally grown. There is an abundance of great produce in season right now that it is easy to leave the market with my bag teeming with fruits and vegetables of every color of the rainbow. It is such a treat to have fresh, off-the-stalk green beans, cucumbers and tomatoes, crisp butter lettuces and a tasty array of sweet-tart berries to incorporate into my diet. Buying local produce is rewarding to both the community and the consumer. Purchasing local fruits and vegetables helps support York County farms and businesses. Local produce purchases shorten the amount of time it takes to get the food from the farm to our tables, ensuring the freshest product possible. You may not be aware of this fact, but the longer a fruit or vegetable sits uneaten the more nutrients it loses. That being said, how much Vitamin C is really in that asparagus being shipped to the grocery from Peru, South America by the time it gets to York County? Buying local produce is starting to look a lot smarter and healthier. So what is the key to selecting the most garden-fresh produce? The appearance, color and texture of the fruit or vegetable are crucial to determining its freshness. Bright, vibrant colors without dark spots, bruising or discoloration generally indicate a good product. Produce such as berries should be dry, firm, not mushy or shriveled; strawberries should have bright green caps intact and seeds should not be hard or brown. Greens such as lettuces and spinach should be crisp and not limp or brown around the edges. Tomatoes, peppers and cucumbers should be vivid in color, firm and juicy, and free from bruising or scars. Green beans, also called string beans locally, should be firm and snap easily when bent. Smell is also an important factor when considering the freshness of a fruit or vegetable. The produce should have a light aroma indicative of its flavor. A strong scent or off scent is a sign that the product is past is peak of freshness and is on its way to spoiling. Use your best judgment. If it looks good enough to eat, it probably is! Now that you have picked the perfect produce, properly washing and storing it will provide the best guarantee that the valuable nutrients will be maintained as long as possible. To clean most fruits and vegetables you must simply rinse them thoroughly under cold, running water. They should be placed in a plastic bag or wrapped in a paper towel and stored in the crisper of your refrigerator. For items such as lettuce heads and other leafy greens, be sure to separate the leaves to remove all the dirt. They should be dried, either by use of a salad spinner or a colander and paper towels; they can then be stored in the refrigerator in a plastic bag for up to five days. Tomatoes are the exception to the refrigeration rule. They taste best at room temperature and chilling them actually expedites the ripening process. You should only refrigerate tomatoes if you cannot use them before they spoil. My favorite spring and summer treat, the fresh berries, generally have the shortest shelf life. Still, with proper handling, raspberries, blackberries and strawberries will keep in your refrigerator three to five days and blueberries will keep for up to two weeks. The key is to not wash the berries until you are ready to eat them as extra moisture accelerates the ripening and spoiling processes. Also be sure to take them out of their original container and place them on a single layer in a shallow dish or tray. If you have too many berries to utilize before they spoil, they are easily frozen. Simply arrange the clean, dry berries in a single layer on a cookie sheet, freeze for one hour then place them in air-tight bags and store up to three months in the freezer. Purchasing fresh, local produce is a wonderful way to add variety and nutrition to your diet. For more information regarding the types of produce available during the various growing seasons, the USDA website (www.usda.gov) and York County’s Chapter of Buy Fresh, Buy Local (www.buyfreshbuylocalyork.com) are very helpful resources. These sites can provide additional information, nutritional values, and a multitude of recipes to complement the produce that is in season. Remember the more colorful your plate is, the more nutrients you are consuming. Don’t be afraid to try something new! Brigitte Brady is a Family and Consumer Science Assistant at Penn State Extension in York County. Penn State Extension in York County is at 112 Pleasant Acres Road, York PA, 17402, call 717-840-7408 or email brb18@psu.edu. The following brief summary documents the presence of buffalo in the Southeast, particularly in present day Alabama. © “On the high plains of North America, the buffalo was the economic basis of Native American life well into the nineteenth century. 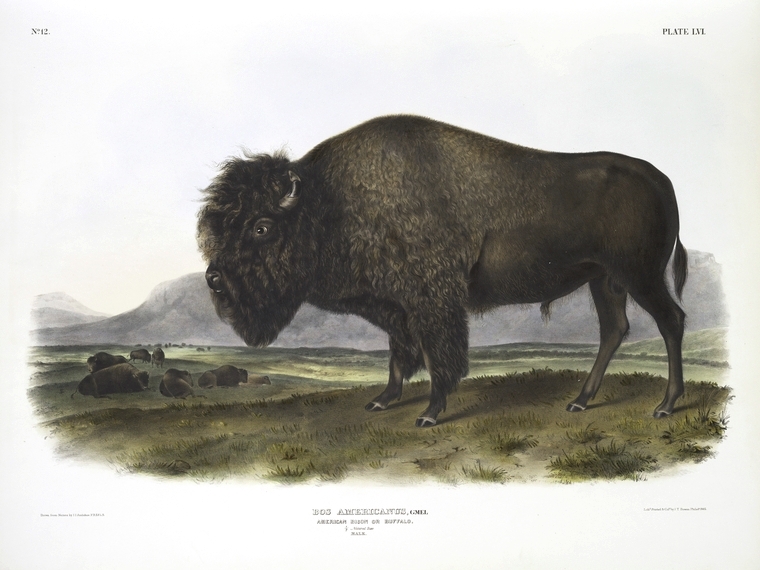 When European-American settlement began to encroach on the area early in that century, an estimated 30 million buffalo lived in a large area from present-day Texas in the South to northern Alberta. East and west, buffalo ranged from present-day New York state to Alabama and Mississippi, to Idaho and eastern Oregon.” – Johansen, Bruce. “The Encyclopedia of Native American Economic History”. 1999. Greenwood Press. Southern states in which buffalo were documented include Virginia, the Carolinas, Georgia, Alabama, Louisiana, Mississippi, and Texas. One writer documented buffalo in Georgia to the middle of the state and in Mississippi to the coast, but stated he had found no primary source from the earliest settlement for buffalo in Alabama. He explained, however, that due to them being common in the neighboring states they were obviously present in Alabama but not documented by the early writers he had studied. 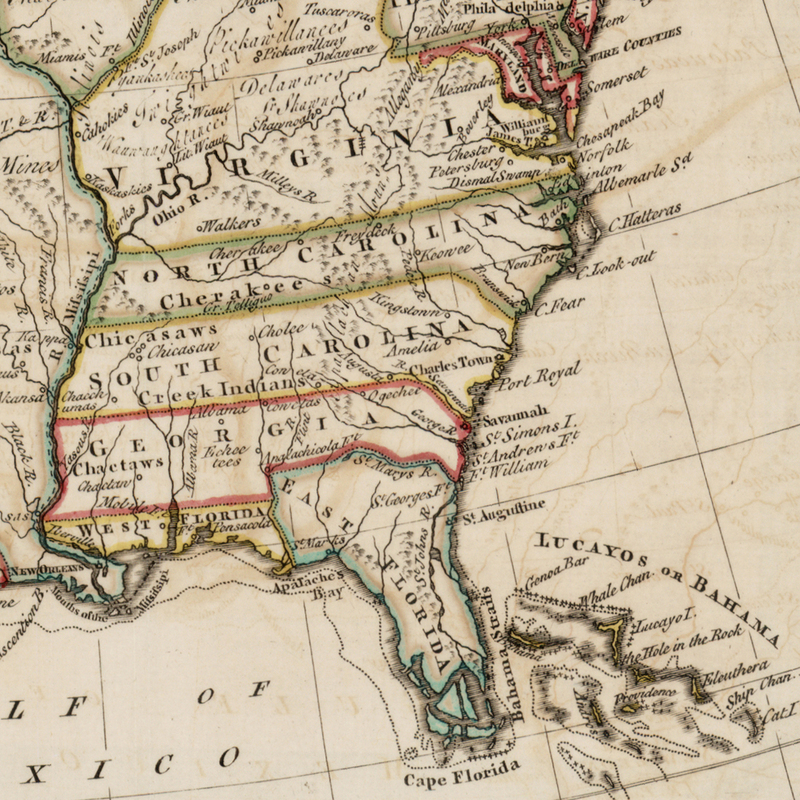 Perhaps this was because in the mid-18th century Alabama was not yet a state and buffalo present in the area were lumped in with neighboring states or territories. [AL became a state in 1819, GA in 1788]. – “The Extermination of the American Bison”. 1889. U.S. Govt. Printing Office. Project Gutenberg. Compare the first map below which dates from shortly after the French and Indian war (mid-18th century) with the second one from 1800 and note how the boundaries of Georgia have changed. In 1800, Georgia’s boundary has receded eastward and the area where Alabama will eventually be is labeled Mississippi Territory. A little known account written in 1708 and published in 1988 documents buffalo in Alabama. The 18th century journal of Thomas Nairne was published by the University of Mississippi Press in 1988, and in it is found the following letter, penned by Nairne: “…the usuall divertion of the hunters was either to look for Bare [bear], fire a ring for Dear or go to the Clay pitts and shoot Buffaloes, for you must observe that in the spring and all sumer these cattle eat abundance of Clay. They find out such places as are saltish, which they like [lick] up in such quantities as if some hundreds of thousands of Bricks had been made out of them, and the paths leading to these holes are as many and well Trod, as those to the greatest Cowpens in Carolina…”. The area Nairne was describing was on the Chattahoochee and crossing the Coosa, near present day Mongomery. – Nairne, Thomas, ed. By Alexander Moore. “Nairne’s Muskhogean Journals: The 1708 Expedition to the Mississippi River. U. of Miss. Press. 1988. Thomas Foster says that buffalo were probably utilized by the Lower Creeks from the 1720’s or earlier. “In August 1739, at a Creek town on the Chattahoochee River (Russell County, Alabama), Oglethorpe’s men observed Creek men hunting turkeys, deer, geese, and buffalo. At another Creek town in Alabama, the white hunters observed that the Indians ‘spend much time in hunting deer, turkeys, and bison’.” He noted that by the 1770’s buffalo were probably becoming scarce in Florida, South Carolina, Georgia, and Alabama. – “Archaeology of the Lower Muskogee Creek Indians 1715-1836”. 1970. Buffalo were prevalent in the area of Anniston, Alabama in the 1500’s according to author Ernest Callenbach who also noted the Army had a small herd of bison at the Depot there during present times. – “Bring Back the Buffalo!”. 1996. An archaeological excavation at Moundville turned up bones which are thought to be bison. They weren’t positively identified as bison bones, but they did come from, “a very large mammal”, and there were distinct skinning marks on the bone further strengthening the belief that they were bison. – Knight, Vernon J. “Mound Excavations at Moundville”. 2010. Tuscaloosa. “Before the days of white settlement in Alabama, herds of bison and elk grazed the prairies of the Black Belt and Wire-grass sections, and black bear and deer ranged the upland forests and river bottom canebrakes.” The author who penned those words went on to say that early explorers into Alabama found the Indians using hoes made from bison shoulder blades. – Writers Program (Ala.). “Alabama a Guide to the Deep South”. May 1941. It is obviously safe to say that buffalo did once roam freely through Alabama, more’s the pity that “civilization” pushed them to the brink of extinction. Good day, – THF.© ALL RIGHTS RESERVED. [See the previous post for more on Alabama fruit and fruit growers.] Peaches are not native to America, though they arrived so early that some of the earliest writers thought them so. Spanish explorers are credited with introducing the peach, as it was documented growing commonly in Mexico 50 years after Cortez arrived and the Spanish are said to have grown it in St. Augustine, Florida by 1565. It was spread in part by the Jesuit and Franciscan fathers. There are many accounts of the “Indian Peach”, and we will examine a few. “The Indian Peach.—John Lawson who was in this country between 1700 and 1708, says in his New Voyage to Carolina (London, 1709), a propos of the peach: ‘I want to be satisfy’d about one sort of this Fruit, which the Indians claim as their own, and affirm they had it growing amongst them before any Europeans came to America. The Fruit I will describe as exactly as I can. The tree grows very large, most commonly as big as a handsome Apple-tree; the Flowers are of a reddish murrey Colour; the Fruit is rather more downy than the yellow Peach, and commonly very large and soft, being very full of Juice. They part very freely from the Stone, and the Stone is much thicker than all the other Peach Stones we have, which seems to me that it is a Spontaneous Fruit of America; yet in those Parts of America that we inhabit, I never could hear that any Peach-Trees were ever found growing in the Woods; neither have the foreign Indians that live remote from the English any other sort. And those living amongst us have a hundred of this sort for one of the other; they are a hardy Fruit, and are seldom damaged by the North-East Blasts, as others are. Of this sort we make Vinegar; wherefore we call them Vinegar-Peaches, and sometimes Indian peaches”. Le Page Du Pratz wrote in 1758 that the natives had peaches and figs when the French settled in Louisiana in 1698. He thought they’d gotten them from the English in Carolina, but it is more commonly accepted that they came from the Spanish in Mexico or Florida. Some years afterward, John Bartram said the peach and plum orchards still stood and bore fruit when he traveled through the Cherokee town, Sticoe, about the Savannah River [Georgia], and he found peaches growing near the ruins of a French town near Mobile, AL. The Indian Peach was introduced into South Carolina from the Indians in Georgia and in 1806, it was, “looked upon a great rarity in South-Carolina, where it has just began to be cultivated”. It was described as having a deep brown skin when ripe, the flesh underneath the skin yellow, and beet red toward the stone. The Indian Peach was somewhat of an anomaly in that old records say it could be grown true to form [at least for several generations] from seed while other peaches are grafted to get the desired result. It is ancient in origin by American standards although some nurseries still sell what they claim to be the Indian Blood Peach. How true these heirloom peaches may be to the original Indian Peach is not certain. Called by growers the Columbia peach, subsequent generations of the Indian were said to be growing inferior in quality when discussed in 1897 and it was noted that it was disappearing from the markets. While I make no claim as to the authenticity of any such-named tree currently available on the market, perhaps those who are interested will be able to search heirloom fruit trees for the closest relative of the original Indian. Blissful Meals, THF. Georgia State Horticultural Society. “Proceedings.” 1897. Augusta. Hilton, William. “A Relation of a Discovery Lately Made on the Coasts of Florida”. 1664. Force Hist. Tracts. Hedrick, U.P. “The Peaches of New York”. Albany. 1917. Bartram, William. “Travels Through North and South Carolina, Georgia, East and West Florida”. 1791. Kalm, Peter. “Travels Into North America”. 1771. Schecut, John Linnaeus Edward Whitridge. “Flora Carolinaeensis”. 1806. Charleston. “Genessee Farmer and Gardener’s Journal.” Vol. 3. Sept. 21, 1833. After working 5 full days sanding off the old finish from three hardwood floors, we used Minwax Wood Putty to fill the holes in the floor where nails were used to secure carpet tack strips. After 3 days, we went back expecting to sand the spots, clean up all traces of dust, and apply varnish to the floors. What we found were oily circles on the floor everywhere the putty had been used and the putty was still soft. 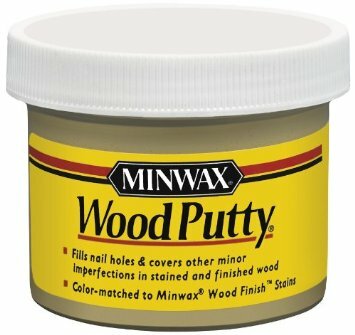 Notice the name of the product is Minwax Wood Putty and there is nothing on the front of the container that gives any hint that the product will not harden. At that point we looked on the back of the jar and read the fine print that says the product will not harden. I ask you, under what circumstances could you possibly want to use a wood putty that remains greasy and soft? If you use it on trim it will be a dust magnet and look terrible in a short time. If you use it on furniture be prepared to try and get the oily residue out of your clothing when you sit on the chair. If like us, you expect it to fill the holes in your nice hardwood floors, you’ve invited trouble. This little fiasco caused us the loss of two weekends of progress between applying the putty, removing the putty, and next re-sanding around the perimeter of the rooms to finish removing the oily stains so the varnish will stick to the floor. After reading reviews, we are by no means the only people who’ve made the mistake of applying the wood putty without reading ALL the information on the jar. One reader likened buying this product to buying a carton of milk and upon getting home finding a notation on the back of the carton that reads, “Do not drink”. “The history of fruit growing in the State begins with the peach, which was brought in by traders and Government agents among the Indians, long before the coming of white settlers. The well-known Indian peach is a development from early varieties. About the same time the apple was introduced. The home of the great Indian leader, Alexander McGillivray, at Little Tallasee, a few miles above Wetumpka was known as the ‘Apple Grove’. Records show that nearly all the early pioneers brought peach stones. Many of our white fleshed varieties are traceable to these seedlings. In the beginning all trees came from seedlings, but as early as 1844 budding was actively practiced. The Cling and Chinese are the earliest known forms. Among varieties known to have originated in the State are Tuskena, the Baldwin, the White July Cling and several others, all by Dr. W. O. Baldwin of Montgomery. The Carter’s Blue or Lady Fitzpatrick apple originated at Mount Meigs, Montgomery County, and was first exhibited at the State fair held at Montgomery in 1856. The Duckett and Red Warrior apples and the Comak, Green Cluster, Horton and Nabours pears are of Alabama origin, but are now little cultivated. The preceding paragraphs document Alabama’s contribution to fruit tree cultivation and remember some of the men instrumental in saving or creating the fruit. The following is a very brief look at both. The Indian peach was brought from the Old World to Mexico during the 1500’s, and by a century later it was found grown by Native Americans in the Southeastern U.S. They have been called Cherokee peach and Indian blood peach. The great naturalist, John Bartram, assumed they were native, and William Penn observed wild peaches had spread as far as Philadelphia in 1683. The Indian peaches are rare today, seldom seen in markets. While most stone fruit are grafted from budwood, the Indian peach can be grown from seed and the seed can be purchased online. Mr. R. R. Hunley was a resident of Talladega, though that could have referred to the county rather than the town. He seems to have been quite the farmer, reporting on his progress with raising cattle, and several fruits, but is most commonly noted in connection with a Japanese peach. Mr. Hunley was referred to as, “the late R. R. Hunley”, in a Georgia Bulletin in connection with peaches distributed in 1877 and which remained in cultivation (published record 1907). “General Lee originated with Judge Campbell, Pensacola, Florida from pits brought from Japan in 1860. In 1864 P. J. Berckmans received buds from R. R. Hunley of Alabama and in 1867 introduced the sort under the name General Lee. The American Pomological Society listed this peach in 1889 as General Lee but in 1897 shortened the name to Lee and so it appears in the Society’s catalog at the present time. We prefer the old name since when shortened it loses all significance as a commemorative appellation”. Richard Ryland Hunley was born in Camden, South Carolina in 1826, died July 7, 1897 in Haynesville, Lowndes Co., AL. Hunley served on committees for the American Pomological Society and can be found as chairman in proceedings for same. He was postmaster for Talladega, 1884-1888 and in 1889, and served as mayor of Talladega. He was a son of Ransom Gayle Hunley and Caroline Matilda Forney [Matilda’s relatives included Peter Forney for whom the Peter Forney Chapter, DAR, Montgomery, AL is named]. He was a student at the University of Alabama, graduating in 1842, with a degree in horticulture. He is buried in Smyrna, Lowndes Co., AL. He went on, “Many in this section feel anxious to raise the fine kinds of plums, cherries, apricots, and pears, but they fear that the climate will not answer. Plums, apricots, and cherries seem disposed to shed or drop all their blossoms just as the young fruit is forming, without the attack of any insect whatsoever. My apricot trees have just finished dropping their very last blossoms, to my very great disappointment.” He asked for advice on how to prevent the problem, and would probably be saddened to know that apricot culture in South Alabama remains uncertain today, but did note his peaches and apples did pretty well. “I have no doubt but pears will do well, and why plums, apricots, and cherries will not do well, is something that I feel particularly anxious to know”. Harwell was well known for his efforts in growing fruit trees in Mobile, and early on propagated peach trees by grafting saying he set his grafts in November and December and lost no more than 5 trees out of a hundred . A Robert Harwell of Mobile County, AL, died in 1868, papers filed in the Probate Court on April 30, 1868. This may have been the Robert Harwell discussed in this article. “Col. C. C. Langdon, of Citronelle, Ala., one of the most experienced and celebrated of Southern horticulturists, says that he has raised pears there twenty-three years and has never known the trees to blight. The White Doyenne is perfect there—beautiful, luscious, smooth; also Duchess, Bartlett, Buerre Superfine, Seckel, Edmonds and others succeed well. Citronelle is thirty-three miles above Mobile…”. Land there was said to be cheap, “a fine resort for people in impaired health…”. C. C. Langdon founded the newspaper in Citronelle and employed men known from war days. On Feb. 18, 1889 it was reported that Col. Langdon , Secretary of State, was critically ill at the Exchange Hotel and was not expected to live through the night. He was 80+ years of age, “and long a prominent figure in Southern politics”. He served as President pro tem of the Alabama State Agricultural Society (1858). Charles Carter Langdon (Aug. 5, 1805, Southington, CT – June 8, 1889, Mobile, AL) was the son of Capt. Giles Langdon and Sarah Carter Langdon. He moved to Marion, AL in 1826-27 along with brothers Levi and Giles Nelson Langdon. C. C. ran for a seat in the Legislature in 1832 and 1833, was defeated, and about 1834 moved to Mobile. He ran again in 1838 on the Whig platform, and was defeated. He was editor of the “Mobile Daily Advertiser” in 1838 and was mayor of Mobile in 1849 and several subsequent years. He was a respected nurseryman at Langdon’s Station, near Citronelle, AL considered the largest in the state by 1858. He did eventually represent Mobile in the legislature for several terms, and unsuccessfully ran for governor of Alabama in 1872 and 1878. 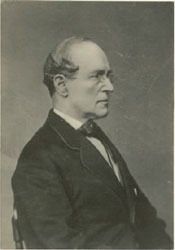 He was appointed Secretary of State in 1885, and confirmed by election in 1886. Probably due to his great interest in agriculture, he served as a Trustee for the Agricultural and Mechanical College at Auburn – today Auburn University. Langdon Hall is named for him. The Baldwin peach, “raised by Dr. Baldwin, of Montgomery, Ala. And ripening about the first of November, is a very superior fruit, and the finest late free-stone peach yet known. When we once get all these late Southern seedlings…we will have fine peaches, ripening in succession for five months, namely, from the beginning of June to the beginning or middle of November, and this more than hitherto has been met with in any country. Dr. Baldwin wrote a letter in 1855 concerning a “native” apple called the Red Warrior saying, “The Red Warrior is a good winter apple, very large, red and striped with yellow, sometimes weighing twenty ounces and upwards. This Red Warrior is a native Indian seedling. I first traced its history and gave it its name”. Dr. Baldwin was credited with finding the Nantahalee (also called Nantahala, Maiden’s Bosom) before 1855 on, “an old Indian farm eight miles from Montgomery, Alabama”. Accounts say Carter’s Blue apple was growing in Mount Meigs, AL in 1840 but a century or so later was thought to have gone extinct until Lee Calhoun of Pittsboro, North Carolina reintroduced it by grafting scion wood obtained from the National Fruit Trust in Kent, England. The originator of the Carter’s Blue apple was Colonel John C. Carter, born in 1832 in South Carolina, and died Dec. 5, 1880, age 47 or 48, in Montgomery Co., AL. He is buried in the Carter Family Cemetery in Mount Meigs. He married Margaret Shellman. Carter was a wealthy planter prior to the Civil War, served in the 24th Alabama Consolidated during the Civil War, and returned to farming in Montgomery Co., AL after the war. The writer went on to discuss Alabama’s fine reputation for fruit growing saying superior apples were grown in every part of the state from Mobile to the Tennessee line. “Very excellent peaches” grew in all parts of the state as well as pears, cherries, and plums. Anyone who grows fruit in Alabama is indebted to these men who pioneered fruit tree cultivation in the state. The next time you gather fruit from your orchard give them a little nod in recognition of their hard work. The Langdon Nurseries near Mobile, was advertised as having, “the largest stock and choicest collection of Southern Grown Fruit Trees, Grape Vines, Ornamental Trees, Shrubs, Plants, Etc. ever before offered in the South”. Upon the death of C. C. Langdon, the nurseries, established around 1853 passed into the ownership of his nephew, Daniel W. Langdon. Sources: Owen, Thomas and Owen, Marie Bankhead. “History of Alabama and Dictionary of Alabama Biography. 1921. “American Farmers’ Magazine”. Vol. 6, I. 11. May 1854. Annual Report. New York State Dept. of Ag. Albany. 1917. “Transactions”. IL State Horticultural Society. Chicago. 1879. New York Times. Feb. 19, 1889. “The American Cotton Planter and the Soil of the South”. Montgomery. Dec. 1858. Obituary for Levi Langdon, brother of C. C. Langdon. Brewer, Willis. “Alabama, Her History, Resources, War Record and Public Men from 1540-1872”. Mongtomery. 1872. Official Register of the United States. 1889. “Talladega Messenger”, April 14, 1881, quoted in the “Montgomery Advertiser”. “Mobile Register”. May 12, 1868. “Our Home Journal”. Vol. 2. Nov. 18, 1871. “The Gardeners’ Monthly and Horticulturist”. Aug. 1880.